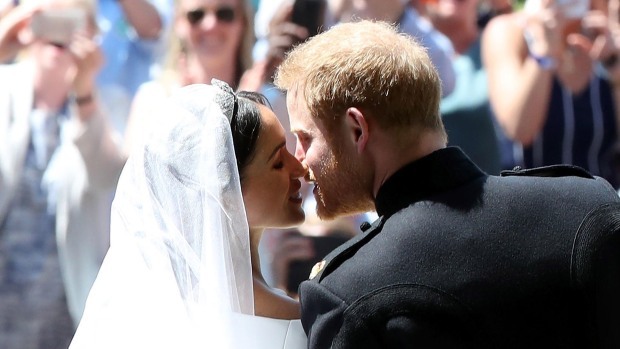 Meghan Markle is sparkling on her wedding day thanks in part to her royal tiara. 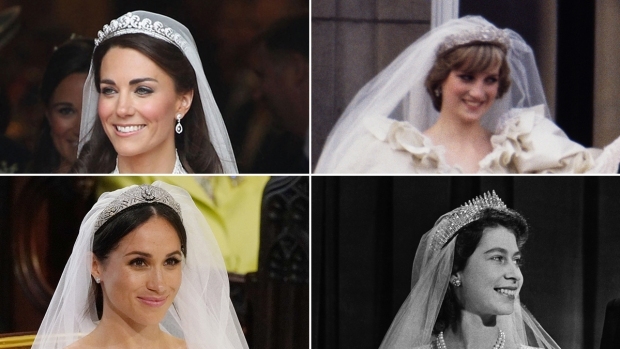 In honor of Meghan Markle's nuptials to Prince Harry, Queen Elizabeth II lent the American star Queen Mary's diamond bandeau tiara, Kensington Palace confirmed. The diamond bandeau is English and was made in 1932. The center brooch dates to 1893. The tiara is made of diamonds and platinum and was formed as a flexible band of 11 sections pierced with interlaced ovals and pave set with large and small brilliant diamonds. The detachable brooch features ten diamonds. The creation has a long history beginning with Queen Elizabeth II's grandmother, Queen Mary, for whom the bandeau was made for, and it was specifically designed to accommodate the center brooch. The brooch was given as a present to the then-Princess Mary in 1893 by the County of Lincoln for her wedding to Prince George, Duke of York. The bandeau and the brooch were bequeathed by Queen Mary to Queen Elizabeth II in 1953. The late Princess Diana opted to wear an 18th-century heirloom tiara from her Spencer family for her 1981 wedding to Prince Charles. Queen Elizabeth II also loaned her the diamond and pearl Cambridge Lover's Knot tiara as a wedding present, which she famously wore frequently after her nuptials. It was returned to the queen's vault, however, when Diana and Prince Charles divorced in 1996. When it came time for Kate Middleton to wed Diana's firstborn son, Prince William, Queen Elizabeth II lent Kate, now the Duchess of Cambridge, the Cartier Scroll Tiara, made in 1936 and gifted to her by her own mother on her 18th birthday.